In order to maximize online exposure, tie up your content to internet marketing, and understand how it is indexed by search engines, you need Social Media Marketing services properly integrated to your activities. Before social media, site exposure was based on the maximum number of links a content can generate, but now, back links aren’t the main focus, thanks to modern internet marketing trends. The reason why internet marketing trends changed is based on the spam tactics and dishonest practices employed by a number of internet marketing firms. They used spam links for indexing and preferred quantity over quality of content. This is where Webryze can make a huge impact on your rankings, by means of excellent social media services in . There is no doubt how important social media services have become integral part of search marketing. They take into consideration how content is shared and found by online users, and create strategies for sharable content. Webryze understands how internet marketing and social media co-exists to boost your search engine rankings. For indexing, high quality website content has been the key factor set by almost all search engines, so that they can index. And social media is the second most essential factor. So, modern technique for link building is to learn how social media is being used for content optimization. Ranking Boost: Regardless of where the content is – on your website, Facebook, Twitter or any other social platform, it has to be unique and original. Whenever the content is liked, shared, tweeted, reposted and commented, its credibility will improve. So, the content on social media platforms directly influences the credible links a search engine indexes. It helps your website get a ranking boost as search engine places it higher on search results. It improves the ranking of your business as well as the author’s on Google. Your visitors and prospects would know that the shared content is reliable. 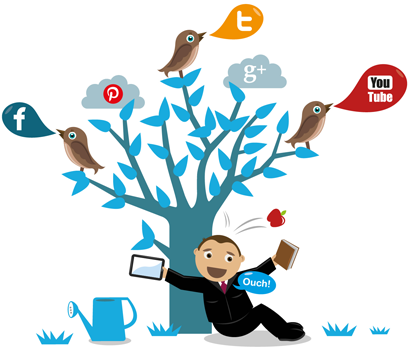 Nowadays, integrating social media services to your online marketing campaign has become more important than before. It directly impacts the rate at which the content has been indexed by search engines. If you hired experienced social media marketing services in , Ontario, indexing rate will definitely increase. There are many factors that influence how social media and your site content are fully optimized including the number of connections, followers, shares, and friends. Where companies tend go astray is by focusing too much on the quantity of links, not the quality of the content. Webryze helps ensure you avoid this common mistake using our social media services to deliver original, high quality content. With over a half decade of experience, our social media , Ontario company has spent countless hours of research and testing in order to fully understand how social media optimization is tied to effective internet marketing strategies which follow best business practices. Webryze even has solutions available for firms looking to increase their exposure locally using our proven methods for incorporating localized social media marketing services in , Ontario as part of your customized solution.